The event was busy and well attended, with about 65 locals and visitors enjoying the day. Steve Joblin, Project Officer, gave a project report to the AGM, thanking landholders and all those who had volunteered on the Project. Shane Monk performed a ‘Welcome to Country’ on behalf of the Taungurung Clans Aboriginal Corporation and was in-demand with landholders over lunch. Those pictured (above) demonstrate the importance of community, networking and volunteering in community groups and particularly for large-scale projects such as this one. Over the course of this two-year project more than 200 volunteers, many returning more than once, have donated their time and goodwill to helped build fences, plant trees, cook meals, manage weeds, monitor fauna, make plant lists, collect seed – the list goes on. 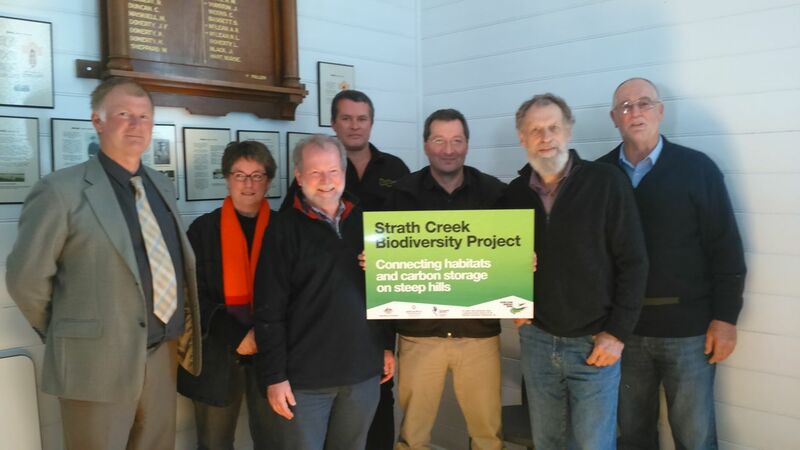 Along with volunteer contributions from the Project Steering Committee, Strath Creek Landcare Group, Upper Goulburn Landcare Network members, as well as the UGLN’s volunteer Treasurer (Rodney Ridd, who rarely misses a beat), this project has been blessed with support. Just look back through the posts at all those people helping out – that’s what really underpinned the project.